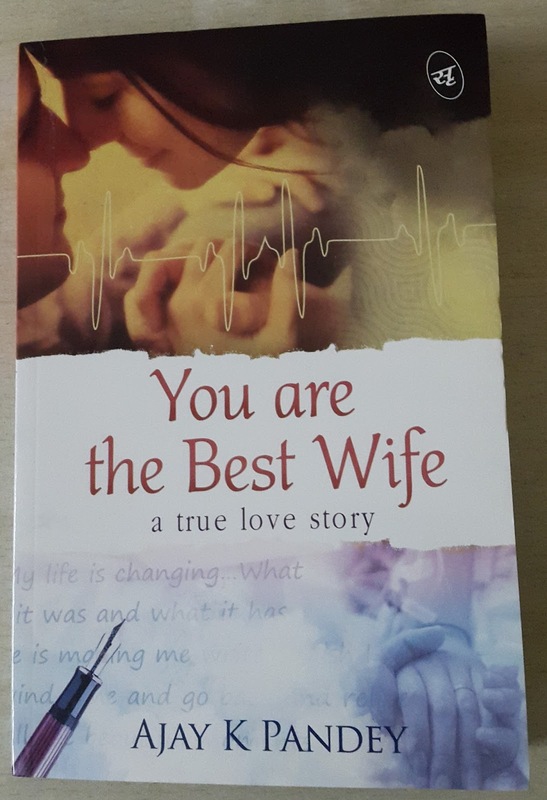 You Are The Best Wife is a memoir written by Ajay K Pandey for his wife. It is story of their love and how he lived his life after her sudden death. I received this book published by Srishti Publishers and Distributors from Reader's Cosmos. Cover : Cover is nice actually more interesting than the story of this book. Picture of a man and woman meeting at hospital depicting the pain of separation. Pen at one corner is indication of his writing about his wife. Plot : It is a true story which starts with Ajay's admission in IERT, Allahabad, he is from Rihand Nagar, Sonebhadra, UP who came to study in that institute. Here he met Bhavna Pradhan who was his classmate. It was love at first sight. They became good friends and Ajay started loving her, sensing similar feelings from her side he proposed her but she wanted only friendship with him. Their love grew gradually with course of time and it was then they decided to marry each other but only with parent's consent. Resistance came from Ajay's family due to their different castes but after some emotional drama by Ajay they were also ready for their marriage. After two years of successful marriage she suddenly died of Dengue leaving an incomplete wish behind. Story ends with Ajay's realization of true life and the lessons learned from it. Note : It is difficult to review such a book which is so much emotionally connected to author's real life but here as a reviewer it is my duty to judge it as a love story book and point out its good and bad for readers. Hits : The language is simple and easily understandable. The flow of the story is nicely maintained till the end. I also liked the message of the story i.e. 'To find happiness in the happiness of others.' There are few more inspirational quotes which I liked in the book. Miss: The story is predictable. It is straight without any high points. By not writing about incidents of Ajay's visit to Bhavna's house during her sister's marriage and Bhavna's visit to Ajay's house during his sister's marriage writer has lost the opportunity of humor and romance during these occasions. It is not clear in the end what he learned from life and what he was doing after learning these lessons. He has tried to insert some funny lines or incidents which not came out the way he wanted and allegory used at some place are not in sync. If he would have connected the incidents of his life with situations of some movies the story would be more interesting. Verdict : Read for Ajay's love for his wife Bhavna. Rating : I would give it 2/5. Such books are difficult for the review but you have done it neatly. Apt review.. I am not into books which have a complex and confused emotional connect.. Will be giving this a miss.. I happened to review a book on the similar lines a few years back. It was very tough. I loved the way you dissected it. Very mature. I found 2/5 is little less. He kept it simple, free from fictious plotted incidents. But it's worth reading. The book will make you feel the pain, helpness of the author. And you'll find a connection to the characters. Would you be interested in reviewing my upcoming book 'One Last Time'? Lookin forward to your response. I can email you the synopsis also if you like.